Care for us and accept us — we are all human beings. We are normal. We have hands. We have feet. Nkosi Johnson spoke those words at the 13th annual AIDS conference held in Durban South Africa in the year 2000. He had been infected with HIV since birth and was just eleven years old. When he died less then a year later, he had the distinction of being the longest surviving child with HIV. Nkosi was born in a poor South African township to an AIDS infected single mom. Gail Johnson was a white South African. She was successful in public relations and was a volunteer at an AIDS care center. Her life was miles away from the life Nkosi and his mother led. But as fate would have it their paths crossed. "I had had a graphic encounter with an AIDS death close to my family, and I wanted to do something more than just talk about it. And there was Nkosi. All I had to do was to reach out to him." With his mothers blessing, Gail took Nkosi and became his foster mom. When it was time to register him for school she was told that he could not be accepted. After all he had AIDS. Gail wouldn’t take no for an answer and fought long and hard. She and Nkosi were victorious, paving the way for other HIV positive children to attend school in South Africa. Before he died Nkosi asked Gail what was to become of the other infected moms and their kids. Out of that conversation Nkosi’s Haven was born. Offering holistic care and support for destitute HIV/AIDS infected mothers, their children, and resulting AIDS orphans (infected or not). Although concerned about the stigma of HIV moms baking and selling bread, we felt there was no more deserving location then Nkosi’s Haven. Plans were underway to open a bigger facility outside of Johannesburg with 17 resident cottages; a sickbay; a therapy block; a library; a baby daycare; workshops and classrooms a Music and Arts center; a leisure room; an upgraded kitchen; a sports field the main administrative offices and our bakery. We were proud to give the residents the ability to make fresh healthy bread but more importantly the real opportunity for building life skills. In addition the village had a new path towards economic sustainability. Nkosi’s bakery opened on World AIDs Day, December 1,2009. It continues to feed the resident moms and their kid’s healthy whole grain bread and supplies other organizations in surrounding communities. Plans are in the works for a second bakery at Nkosi’s 4Life farm, a self-sustaining “Kabbutz” style farm for HIV/AIDS infected moms and their children. Rosie Mashale was living in Khayelitsha, Cape Town’s largest and poorest township. She was very disturbed by the large numbers of orphaned and abandoned children scrounging for food in the dump but wasn’t sure how to help. One morning she woke up to find an abandoned baby at her doorstep. It was the message she was waiting for and with hard work, determination and community support, Baphumelele Children’s Home was born. Baphumelele is a place for over 200 abandoned, abused neglected and orphaned children, many HIV positive. The kids range in age from three months to six years. They are housed, fed, cared for and schooled but most of all they have a home. When well-healed tourists on guided tours asked that some of their money go towards alleviating local poverty the tour company agreed and the Colette Foundation was formed. When two yogini’s from California realized the potential good that could come out of the yoga world they created Off The Mat Into The World, an organization for social change. These two NGO’s, The Collette Foundation and Off The Mat Into The World came together to provide the funds for Rosie’s bakery. We opened in February 2011 with the Mayor of Cape Town officiating. The fully equipped bakery was built in a converted shipping container, a concept used frequently in the third world. 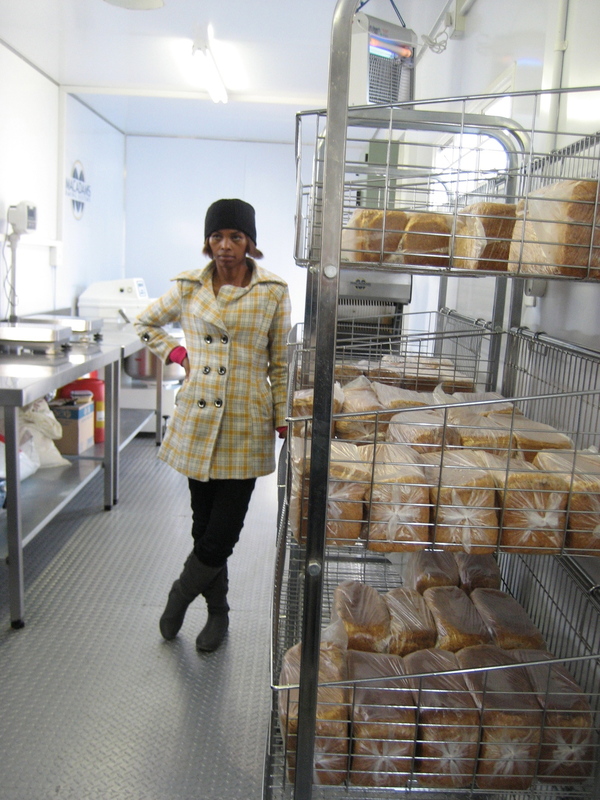 Our first bakery at Nkosi’s Haven Village completed two years earlier was also in a shipping container. The bakery produces high quality brown bread, ciabatta bread, vetkoeks and scones. As well as supplying bread for all the children and Baphumelele’s many outreach projects, the bread is sold to the local community and other Non Profits. Rosie’s bakery has another very important function, to train disadvantaged youth. In a pilot program, two young women were referred from the Child Headed Homes Project, a program to help children taking care of their siblings without any adult supervision. They were trained in bread making and employed by the bakery enabling them to support the rest of their family. In the future this program will be expanded. As with all Baphumelele projects, an important goal of the bakery is to enable young people to go out in the world and have the skills to be able to live full productive lives. Soul Of Haiti, an Irish NGO, contacted us about partnering to create a bakery in Port Au Prince Haiti early in 2012. The more I heard about the project the less confident I felt. St Martin is one of the most economically deprived areas in Port-au-Prince. It is inhabited by approx. 100,000 people in an area not much bigger then a few square kilometers. Plagued by gang violence and an unemployment rate approaching 90% the neighborhood has limited electricity, no sanitation and little to no running water. The silver lining to the story was Grandoit, a local entrepreneur with a checkered past. A rehabilitated gang member, Granoit saw the light after his father, a well-known baker, perished in the devastating earthquake of 2010. When Soul Of Haiti found him, he was baking little dinner roles in a shed with no floor or roof. His equipment consisted of a very old broken down home oven, a couple of mixing bowels and a wooden table with a primitive dough roller. The challenges were many. We enlisted the help of the Enactus team from Syracuse University. Enactus is an organization encompassing 1600 Universities in 36 countries. Each University forms a team dedicated to creating or improving existing triple bottom-line social welfare projects. The teams compete in a once a year world cup judged by business leaders from international fortune five hundred companies. ICB had been active in the organization judging competitions for many years and had developed a strong relationship with the Syracuse team. Providing a propane oven and a solar array connected it to a small generator solved our electricity problem. A water tank provided us with enough water storage in between deliveries and a new floor and roof gave Grandoit a bright clean space to work in. H & K a global restaurant supplier donated all the equipment including the oven as well as a mixer, scale, multiple worktables, bowels and assorted bakery hardware. In March 2013 ICB and Syracuse Enactus went to Port Au Prince and conducted a three-day training seminar with Grandoit and his staff. Soul Of Haiti has been very active in the community initiating projects from street cleaning to the painting of buildings with Merci Bon Dieu Bolangerie as a centerpiece. The bakery employs 4 young men from the neighborhood as well as Grandoit and his wife. An expansion is already underway and a training program for bakers is being developed.